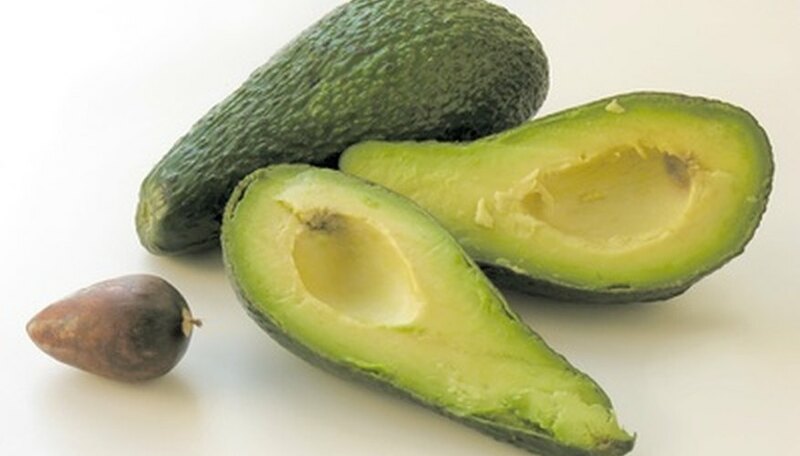 Avocados are native to tropical areas of Central and South America. The species (Persea Americana) is easily grown outdoors as part of the home landscape, provided that garden exists in a limited number of frost-free areas in the U.S. Without pruning, trees reach heights up to 40 feet, and normally bear green to purple, 3- to 6-inch fruits spring through summer. Avocado trees are classified as evergreen, and are hardy to USDA zones 9 to 11. In the United States, that translates to just three main areas of the country. According to a University of Florida Extension publication, the avocado was first imported into tropical parts of the state in 1833. Currently, commercial production is found mostly in Miami-Dade and Collier counties. West Indian, Guatemalan and Mexican varieties are widely available from nurseries across Florida's southern coast. Plant trees in the home landscape in sunny locations, 30 feet apart. Choose an area with well-drained soil and apply a general fertilizer once a month during the first year, and once per season thereafter. Water deeply and often at planting, and after the first seven days, irrigate the tree one to two times per week. Several insect pests and fungal diseases are known to attack avocado trees in South Florida. Avocados are grown in home gardens along the Pacific Coast from San Diego to Humboldt Counties. The trees were first introduced in 1871, and now the California Avocado Commission claims the state is "the leading producer of domestic avocados and home to about 90 percent of the nation's crop." The commission says to plant avocado trees in slightly acidic soil, in a sunny, wind-protected location, between March and June. Commonly found in home landscapes across South Texas, the avocado performs well in most well-drained soil types of the region, according to the Texas A&M Extension Service. Avocados are not widely grown as a commercial crop in Texas, so planting a tree from seed is not recommended. Most fruits purchased in Texas markets come from California. The dry, hot Texas summers often cause tip burn on leaves, so water adequately during such times. Fruits ready to ripen are susceptible to sunken, black spots caused by anthracnose. Other fungal diseases are possible but not common in the Texas climate. Insects are not of much concern, but opossums are known to steal fruit from backyard trees.